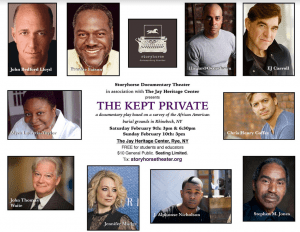 The play reveals the real life struggle of a 93-year-old African American man to claim his rightful pension for three years of service in the Revolutionary War, through the Battles of Harlem and White Plains. It is produced by the Storyhorse Documentary Theatre. Born about 1742, Andrew Frazier served in the military from 1775–1778. As a wagon team leader he first transported enemy munitions to be melted down for patriot re-use before becoming a body servant for Colonel Morris Graham. Frazier was among the troops that marched from Pine Plains to Tarrytown, from West Point to Sing Sing, served at the Battle of Harlem and marched toward New York City at the time that the British took possession. He was also was part of the retreat of colonial troops through New Rochelle and Rye, and at the Battle of White Plains. His quest to receive remuneration for his service however, was challenging because he was black and likely enslaved at the time of his service. Light refreshments and a Q&A with the actors will follow the performances, which are scheduled for this Saturday, Feb. 9 at 3 and 6:30 pm, and Sunday, Feb. 10 at 3 pm. Performances are free for students and educators, $10 for the general public. Seating is limited to 150 guests per performance and pre-registration is requested. To reserve tickets, click here.